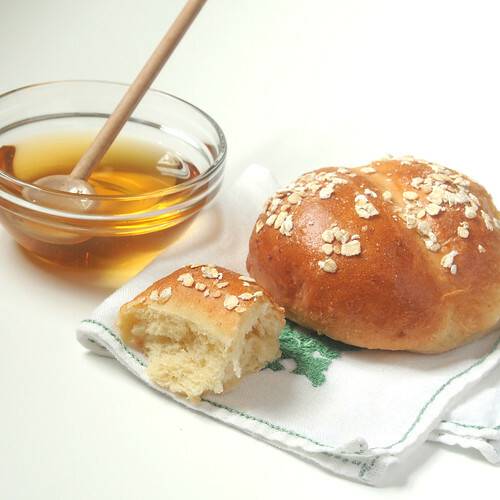 I think you’ll love these Honey-Oatmeal Dinner Rolls–soft, light and fluffy with just enough oatmeal to give a little chew and make them interesting. Although they have some honey in them, they aren’t overly sweet so my husband insists they be eaten dripping with honey. I agree. Wait until you smell these homemade rolls baking in your kitchen! 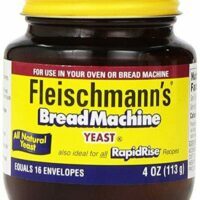 Not only is the heady fragrance of yeast going to make your mouth water but the oatmeal topping gives the slightest suggestion of cookies as the rolls bake. Because these rolls have oatmeal, I really wanted to go all the way and make them really healthy. For the record, I tried substituting 1/2 cup of whole wheat flour for 1/2 cup of white flour. The result was not so good, producing rolls that were somewhat heavy and dry. If you go this route and it turns out well, let me know the proportions you used. I think there are possibilities, I just haven’t figured them out yet. The directions given are for a bread machine because it produces the best bread in my opinion. But you can make it with a stand mixer (general directions here) or by hand if you prefer. 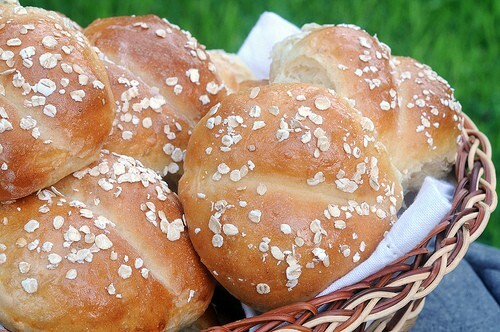 Honey-Oatmeal Dinner Rolls--soft, light and fluffy with just enough oatmeal to give a little chew and make them interesting. Combine milk, water, butter and shortening in glass cup and microwave on HIGH for 1 minute. Add to bowl of bread machine followed by remainder of ingredients in order listed. (Regarding the flour: start with the smaller amount. Add more flour 1 tablespoon at a time, if necessary, after machine has started to bring dough to right consistency.) Set machine on dough cycle and start. If you are new to using bread machines see the video above for a quick tutorial on getting your dough to the right consistency. When dough cycle is complete, turn dough out onto a floured surface. Divide dough in half. Divide each half into 8 rolls for a total of 16. Use fingers to make each portion into a smooth ball. Place on a greased cookie sheet. Allow to rise until almost double. Turn on oven about 15 minutes before you are anticipating rolls will be ready to bake. Use the dull side of a thin knife or a wooden skewer to gently press down in the middle of each roll. Dipping your knife or wooden stick in flour makes it easier. Whisk eggs and water together for glaze and gently coat rolls. Sprinkle a few quick oats on top of each roll before the glaze dries. Bake at 350 for 10-13 minutes. Allow to cool on a rack for a few minutes or eat as soon as they are cool enough to eat. This recipe is great! I just made them, and they are so light, and so so good. I made a few substitutions, but stuck to the proportions for the most part. Thank you!! I usually don’t comment about recipes unless it is either very good or very bad, mostly because people leave so much excessive praise for recipes on food blogs when often the recipes are not very good. This recipe, however, is pretty excellent. I am not an inexperienced baker, but often new recipes don’t always turn out perfectly. These rolls turned out perfect the first time I made them, and the rolls were extremely soft and delicious. 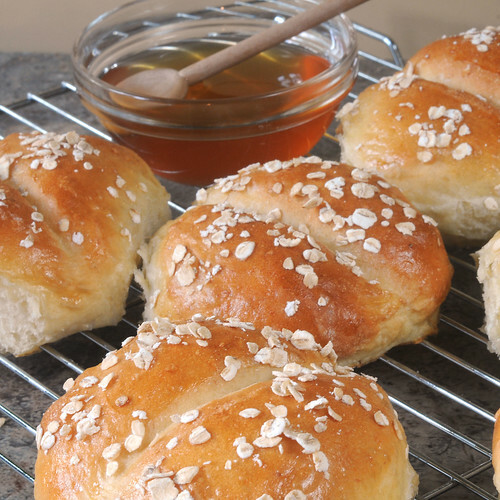 The oats on top don’t do much to flavor the rolls – it’s a very light hint of oat. So, if you’re looking for a very “oaty” roll, this is not it. However, the light oat taste is a nice compliment to the faint taste of honey. I have definitely saved this to my personal archive of recipes to hang on to! As a follow up, I *did* make the rolls smaller than pictured. I think they’d bake equally well if made larger, though think I will continue to make them on the smaller side to assure a certain kind of very round, ball-shaped rise. I don’t understand amount of flour is it 2 and 1/2 cups then add 3/4 cup as necessary? I just looked at the recipe and changed it to hopefully make it clearer. You guessed right. Add 2 1/2 cups to start with. Then add 3/4 cup as needed. The amount you need can really vary according to the humidity. I made a sweet roll version of your rolls last week. Such a fun way to get a little oatmeal in the morning. I’ll have to try the dinner rolls soon too. Thanks for sharing. I made a wheat version of these today that came out VERY nice 🙂 I substituted 1 cup of the AP flour for wheat flour. 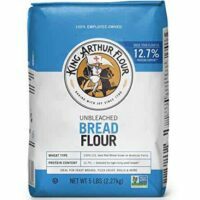 I used King Arthur flours, which I do think are better than average quality – nice, light, fluffy rolls. I also didn’t have milk in the house so I used 1/2 and 1/2 instead. The extra fat probably helped keep them from being dry. I made a whipped honey sea salt butter to go with them, and it was a FANTASTIC combination. For the butter, whip 1 stick unsalted butter until light and fluffy. Add 2-3 tablespoons of honey and 1/2 a teaspoon of coarse sea salt and whip until incorporated. The salt gives the butter a slight salty crunch and balances the sweetness of the honey. Obviously I’m going to have to go through and try all your bread recipes as they keep turning up winners. Kristen, I would do the first. Freeze after you shape the rolls but before they rise. Allow at least a couple hours for rolls to thaw and rise before time to bake them. Hope you love them as much as we do. These look amazing! I want to make these for Thanksgiving but would be best with my schedule to make a head of time. What do you think the best thing to do would be? Make the dough and have ready to go in oven but freeze and bake that day, or bake then freeze and warm up in oven so they are warm when being served? Hey, these sound so delicious! One problem, I don’t have a bread machine. Any helpful suggestions for the bread-machine-less? 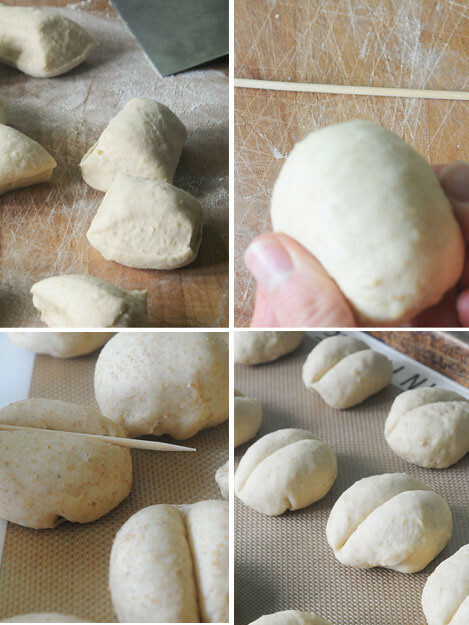 There is a link right above the recipe where you can see general directions for making these rolls without a bread machine. Hope that helps. Yum! Thank you for the whole milk substitution in the recipe too! 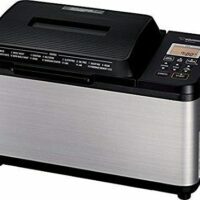 Another bread machine beauty from you! These oatmeal rolls look fabulous and I love the dripping honey idea! YUM!!! I am definitely going to try and make these someday! My mom used to make this oatmeal bread that I loved; she toasted it, buttered it and then topped it with a smear of cinnamon applesauce. It was divine. These rolls remind me of that bread. Thanks for taking me back. oh, I love oatmeal so much! Gorgeous rolls! – and the oats make them so unique. I’m into oats theses days (muffins, cookies, bars) – so this will fit right in. Love the skewer technique as well – and a “little” honey is never enough (I agree)!